Are Western Draws making you Crazy? What are your thoughts on big game draws? Except for paying taxes, few things frustrate me more each spring than participating in Western big game drawings. Judging by the reaction of many Bowsite visitors, I’m not alone. My frustration is not confined to Elk, Sheep, and Moose either, many deer states are making their draws unnecessarily complicated and jacking up fees as well. I realize game management can be complicated. I serve on a board that oversees management in my home state. I am acutely aware of the dynamics involved like politics, funding, skillsets, and the complexity of wildlife biology. And I am not going to disparage any of the hardworking, decent people who officiate these draws at the state level. I feel for them. This feature is directed at the state politicians (and bureaucrats) who refuse to fund, revamp, or even consider the complicated mess many of our big game draws have become. Some of which haven’t changed since the eighties. Before I get into it, I need to acknowledge there are variables out of everyone’s control. Like the increased volume of hunters applying for tags and point creep. When I first applied for a G5 Colorado Goat tag in 1990 there were 2 nonresident applicants and today there are thousands. More people are participating in Western draws than ever before. So this article is focused on the things that are controllable. 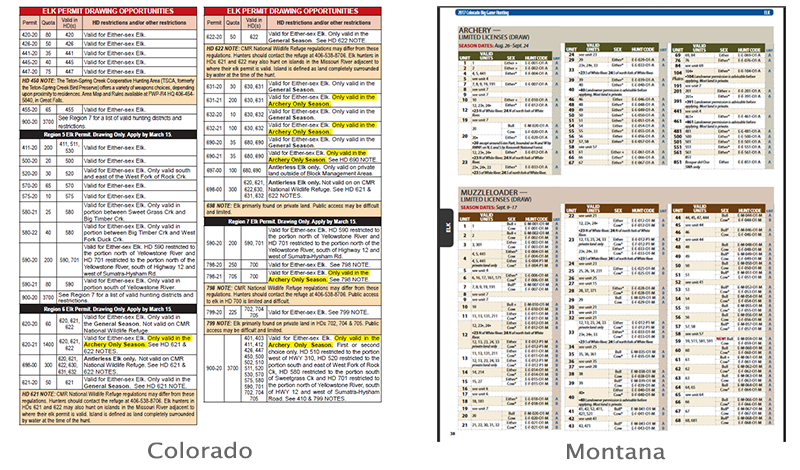 Flip through virtually any Western Big Game brochure. I often feel like I need an attorney to interpret them. It happens every year. An experienced hunter excitedly learns he drew an Arizona Elk tag, only to find out they mistakenly chose a cow hunt code and his points are gone. I’ve made mistakes too. Just this year I applied for a Montana Elk permit in the breaks. 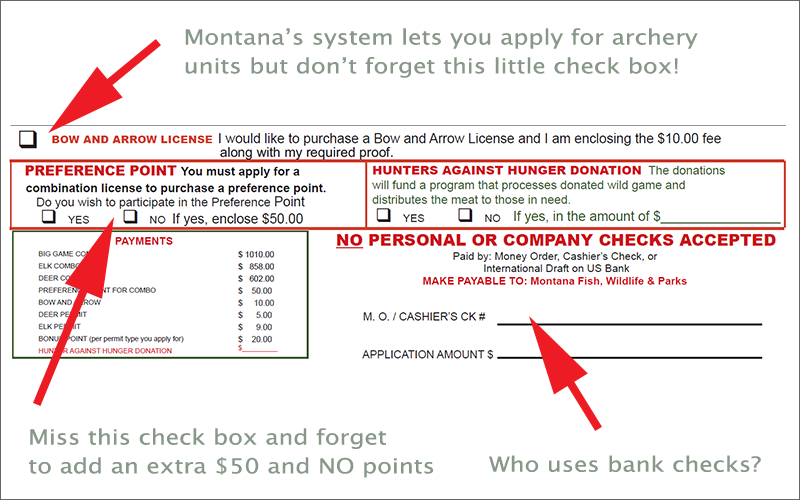 I found out while reading a discussion (on Bowsite) that I should have purchased an archery permit. The system allowed me to pick an ‘archery only’ unit even though I didn’t purchase the bow license. My mistake? Yes, but with today’s technology that should not have been possible. I don’t know about you, but my complicated work schedule requires me to plan vacations early in the year. Finding out draw results for late summer hunt in June is, well, ridiculous. Many of you who follow my hunts may have noticed I’ve not gone on a big game hunt in a while. That’s because I am finally "in the game” on points. I have 10 in AZ, 10 in Colorado, and similar numbers in other states. So, the possibility of drawing a limited tag is good. This factors heavily into my hunt planning. Just recently a great hunt came up for auction at the Pope and Young banquet. I failed to bid on it because I was confident I would draw a western tag, somewhere. As it turned out, I didn’t. I accept unsuccessful drawings and am perfectly fine with that. I just wished I knew about it earlier so I’d have time to figure out a Plan B.
I love preference points, and I hate preference points. Some draws I’ve abandoned altogether - like Colorado Bighorn Sheep. I applied for over 20 years for a Colorado Bighorn tag. I reached the 3-point max in the 90’s and then accumulatied all those ridiculous weighted points. To this day nobody has been able to explain their value to me. Eventually, I grew tired of lending thousands of dollars to Colorado for draws with extremely low odds. In Arizona, I should be at 12 preference points but I allowed an outfitter to apply for me. He made a simple mistake on my app and that cost me both the "loyalty point” and the PP for that year. And in Colorado I have 10 elk points that I am afraid to use. I often agonize if it’s better to hunt a decent 4-point unit every four years? or go for a primo 15-point unit which I will be lucky to draw once in my lifetime? Of course, by the time I get that primo unit I’ll probably be 60, and in a far inferior physical condition than I am today. It almost seems like a cruel joke. By the time you can afford one of these expensive draws you are in your thirties. By the time you actually draw you may be in your 50’s and 60’s. I know someone who drew the coveted Desert Sheep tag in his 70’s and was physically unable to bowhunt. How tragic is that? I referenced the mistake made by my outfitter which cost me two points. While I was upset with the outfitter, I was more upset by the punishment. Lots of states have penalties for not paying attention to their complicated processes. It reminds me of Catholic school where the nuns would use negative reinforcement to force participation. This would be fine if you are lazy and blew off a draw. But someone that makes an honest mistake can find their points are gone for good. Imagine the guy who has been dutifully putting in for Colorado Elk for 15 years - and chooses the wrong hunt code on that ‘eye-chart’ of a brochure? He just burned 15 points on a cow elk tag! Many, state agencies feel it’s OK to treat hunting applicants the way United airlines treat passengers on an oversold flight. If the process is easy and straightforward then you have nobody to blame but yourself for making mistakes. However, we all know that few of these draws are easy or straightforward. They were designed by a sadist! I know I’m going to get crap over this (particularly from residents) but seriously, must a non-resident Elk tag cost thousands of dollars? Are we really forced to buy a state license (I’m talking to you, Arizona) to participate in a draw where we will likely never step foot in that state? Now, I’m perfectly capable of plopping down cash and playing the western draw game every year. But there are so many people who cannot send Montana $1000, even if they get 80% of it back if they don’t draw. The politically riskless notion that a State can keep raising revenues on the backs of nonresident big game hunters will eventually bite us - in my opinion. When only affluent hunters can afford to play, the other 90% will not be there when a state needs us. Just look at what’s happening with limited tags going to groups like SFW and high end auctions? If these funds go directly back to wildlife programs (that can demonstrate success) I have no argument. But many states have begun claiming portions of that money to fund social programs, roads, and for covering mismanaged finances. We see it all the time back east. While it may feel good thinking this money goes back to sheep or elk, it may be feeding some bloated state bureaucracy. It requires examination. Many State game agencies have already privatized their basic hunting and fishing license purchases to a third-party administrator (TPA). This is extremely cost effective. These firms hire smart, competent, and innovative professionals. When they approach a new engagement, they bring in a process re-engineering team who works with the unit to identify ways to reduce complexity, duplication, delay and inefficiency. I have done this within my organization. They will ask questions that need to be asked - like does Colorado really need all of those hunt codes? and is the preference point system really fair and effective? I don’t know the answers. But someone should be at least, asking these questions.The hard part will be getting the State Game Agency to agree with this. I have no doubt privatization will be a threat to anyone with a personal stake of keeping things status quo. I’ve seen this happen dozens of times but in the end, the change is necessary and everyone knows it. Now this is really a stretch but imagine if one TPA handled all the big game draws? Enter your information once and then pick the big game drawings you are interested in? I know it’s a pipe dream do to the ways states operate but it is very doable. I agree that privatization is aspirational. The next logical option is Digitization and process re-engineering. I ask these questions: Why am I mailed a 120-page brochure every year from each Western Big Game State? When apps are accepted through a website, why is there no logic that forces prerequisites based on choices? For example, I want to hunt the Breaks in Montana, I simply go to the Montana Draw website on my Smart Phone. I enter my ALS# and choose elk. I am presented with a Map of the Elk units. I first choose that Unit from a drop-down list. Then there are a series of drop down choices which correspond to what’s available in that GMU; such as Archery or Rifle, Bull or Cow, etc. 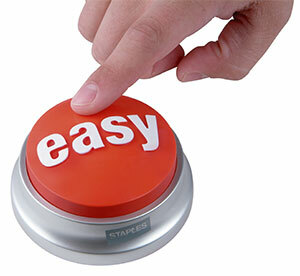 After you hit the submit button, you are presented with everything required to enter that drawing along with an ‘enter-now’ button. All prerequisites are tabulated and then you simply enter your credit card number for the fees. Done. You get an email confirmation and receive a successful/unsuccessful notification via text or email when the computer draw is finalized. I want to know early what I drew and didn’t draw. I’m sure there’s good reason for draws occurring in late spring but if there is no compelling reason for it, why not push them up? I’d love to know my hunt plans by March 1st rather than June. I think most hunters would welcome this. I certainly would. Do away with penalties. Instead, build a process that prevents human errors and omissions in the first place. Remember, if the process is so onerous that people are making errors, that is the fault of the game department, not the customer. 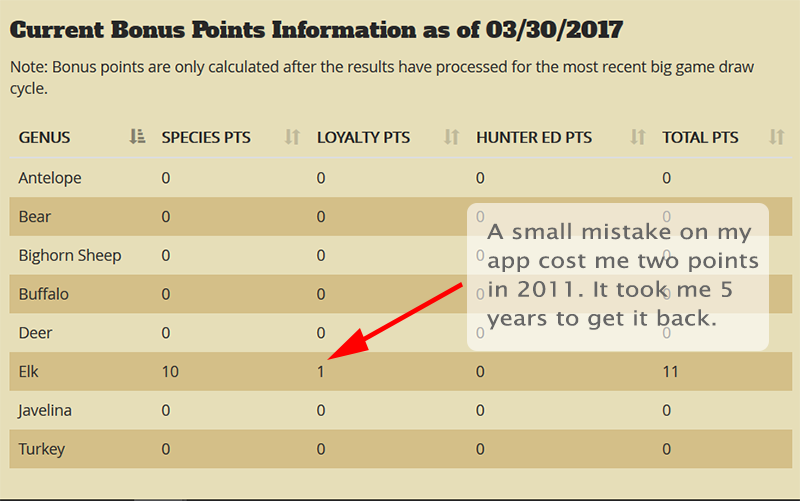 If someone can’t read the tiny font on the game app and uses 16 points on a cow tag in a drawing, then have a process that reinstates those points - hell, even if you charge a $5 fee it’s better than ruining the person’s year! Every company is re-thinking the way they do business, from using computer automation, to taking a hard look at their processes, to digitizing their customer experience. The big game drawing system is in desperate need of this. It is, quite frankly the most ridiculously arduous process I’ve ever seen outside of DMV. I doubt change is going to come quickly. But just like hitting refresh fifty times on drawing day - I can dream, can’t I?